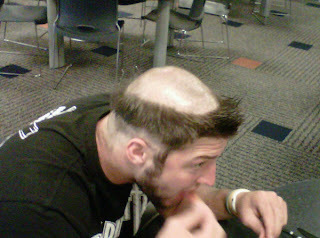 The PackerPage: HOLEY HAIR-DO TEBOW! 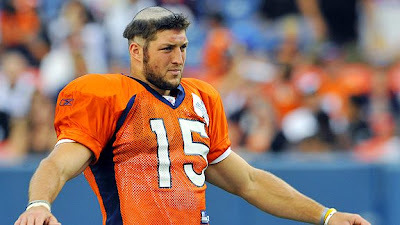 Denver Broncos rookie QB Tim Tebow is either trying to start the sports-nation's next big fad or he's been hanging around the Merry Men way too much. It was only after a man-of-the-cloth was called in to see if the former Gator was exorcism-worthy when a priest close to Linda Blair recognized what Tebow was really going through. Turns out, Tim isn’t possessed at all. He’s simply suffering from a rare spiritual occurrence known as "Wigmata..." a sudden and spontaneous loss of locks in a fashion that curiously parallels the hair-style of religious figure Friar Tuck. Aside from giving his teammates something to rub for good luck before each Broncos game, his Rogaine-endorsed melon is opening up other doors of opportunity as well. Tebow says he’s seriously considering other career offers which have recently come his way, including a gig as the new San Diego Padres sideline mascot or a more financially stable job at Medieval Times. And just yesterday Universal Studios approached Tebow to co-star alongside Dan Akroyd in the remake of the classic John Hughes film "The Great Outdoors" to play the role of Bart the Bald Headed Grizzly Bear. And if by some chance the NFL quarterbacking thing with the Bronco’s doesn’t quite work out, well... his hair should all grow back by the time he accepts that starting job taking snaps in the UFL. BRETT FAVRE RETIRES AGAIN... NOW WHAT?